We’re back home from a wonderful Drum Camp that we go to annually! 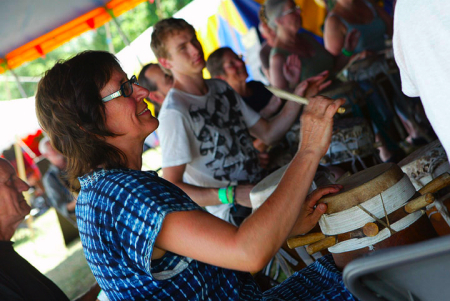 Each day I did two workshops – one sabar drumming in the morning and in the afternoon sabar drumming for the dancers which is very fast and energetic! We also attended an early morning workshop twice which was called a Gong Bath – everyone lay on the ground for about an hour in a closed big top and closed our eyes. Then the guy running the session created the most amazing soundscape using gongs, chimes, singing bowls, bells, flutes, rain makers and other strange instruments. He moved around while generating the sounds which led to the effect of strange sounds washing over you from all directions. Slowly you lose sense of everything outside the marquee until you are brought right into the moment – very similar to meditation and I was quite transported by the experience – thanks to Ant the facilitator for that!